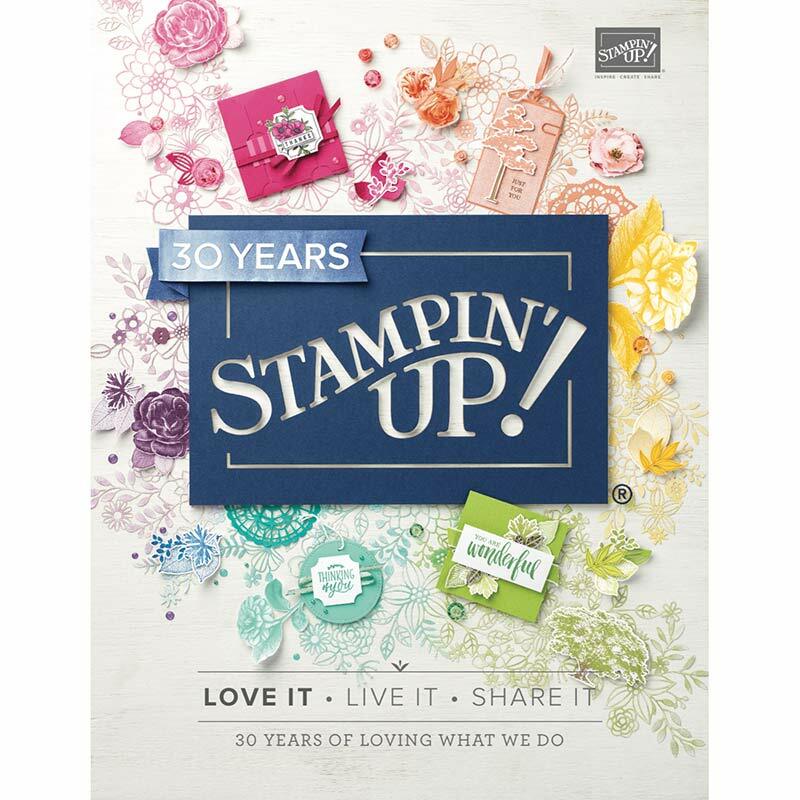 The Lots of Happy Card Kit from the new Stampin’ Up Occasions Catalog makes me “HAPPY!” It’s an all inclusive Kit with everything you need to complete to make 20 cards, including stamps, ink, a stamp block, adhesives, embellishments, envelopes and FOUR watercolor pencils. Watercoloring these cards was actually quickly done using Blender Pens. Here’s a “group shot” of these gorgeous cards. Truly beautiful! As you can see, I used the stamp set that was included to decorate the envelopes, also. Stampin’ Up also offers a complete set of Watercolor Pencils with even more colors, so I pulled out a couple of those for some alternate ideas. I wanted a truer blue for the lavender, so I used the Pacific Point Watercolor Pencil. I used the Daffodil Delight Watercolor Pencil and Wink of Stella on this card. See the shine on the flowers? Just that little extra touch with Wink of Stella! So much fun to complete this Kit! Look at everything that’s included! This all-inclusive Kit is just $35.00 in the Occasions Catalog, Item 146388. Add just $15 in product to that order and get a FREE Sale-A-Bration Item that coordinates with the Lots of Lavender Stamp Set. One of my favorite things about using Stampin’ Up products is that everything is coordinated for you! And this Lots of Lavender Stamp Set perfectly coordinates with the Lots of Happy Card Kit. Let’s celebrate SALE-A-BRATION with a picnic! Sale-A-Bration runs January 3rd-March 31st, and this party will be for everyone who does one or more of the following during Sale-A-Bration. 1. Promotes to the next level. 1. Joins the Crafting on the Hill Team. 2. Places $300 in Product Orders. 3. Hosts a Party with $300 in Product Orders. This is going to be a VERY special Event with a fun picnic, make and takes, games with prizes, and a special goodie bag for each attendee! So get ready and start planning you Sale-A-Bration now!! Need more info about Sale-A-Bration? Contact me today or go to my website at www.craftingonthehill.stampinup.net. Want to know more about joining the Crafting on the Hill Team? Go to my website at www.craftingonthehill.stampinup.net and click on the “Join the Fun” tab. Or contact me TODAY and let’s get you started!